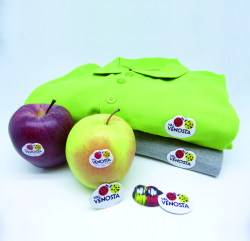 The logo of the Vinschgauer Erzeugergenossenschaft (VIP/Vinschgau Producers‘ Cooperative) decorates millions of apples from the region every year and Corpus was assigned with the task of conveying the logo onto textile promotional products – as small as possible, true-to-detail, high-quality and well visible in different colours. Whereas other companies write their own success, Corpus opted for a woven logo made of ultra-thin polyester yarn set in a white frame, which presents the detailed VIP motif in the perfect light. The special feature: The woven logo is smaller and at the same time finer than a comparable embroidered embellishment, the white frame accentuates it further and makes sure that the motif doesn’t have to be adapted to suit different textile colours. Furthermore, in contrast to an embroidery, affixing the individually laser-cut woven logos is an easy process – even on outside and breast pockets. The fine, Oeko-Tex Standard certified weaving yarns are available in over 500 standard shades, so almost all logo colours are possible. The filigree woven logo that is true-to-detail as well as being a discrete, yet highly effective design option for among others caps and shirts picked up a Promotional Gift Award 2017 in the category Customising Technologies.